Okay, continuing on the CSA post trend… Sorry. [Not really. They’re yummy, and half the veggies we have in the fridge at any one time.] So far, my favorite item that I’ve received in my CSA basket has been freshly picked sugar snap peas. Ohmygoodness, they are so great, so sweet, so crunchy. I’ve been eating them by the handful straight out of the fridge. Yum. Since my husband isn’t much of a fan of very many raw veggies, I decided it would be nice to share some sugar snap peas with him. 🙂 Hence, this dish–Lemony Roasted Vegetable Couscous. I’m so nice, right? 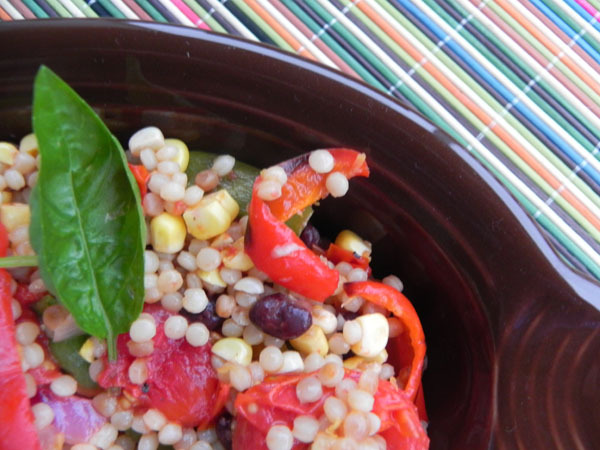 This chilled couscous is fabulous for a lunch or as a side dish for a summertime BBQ. Just be sure you make enough to share! Preheat oven to 450 degrees. On a large baking sheet, spread the tomatoes, peppers, and peas out in a single layer and drizzle with olive oil [maybe a tablespoon or so], then season with freshly ground lemon pepper. Toss to coat. Roast for 10 minutes or until tomatoes burst and peppers begin to blacken. Remove from oven and let cool. Meanwhile, in a medium saucepot, heat about a tablespoon of olive oil over medium-high heat. Pour in couscous and saute for 2-3 minutes until grains are lightly toasted. Then, pour in chicken broth and bring to a boil. Reduce heat and simmer for 10-12 minutes or until liquid is absorbed. Next, heat 1 teaspoon olive oil in a small skillet set to medium. Add black beans and onions and cook for about 4-5 minutes, or until onions are crisp-tender and beans are heated. 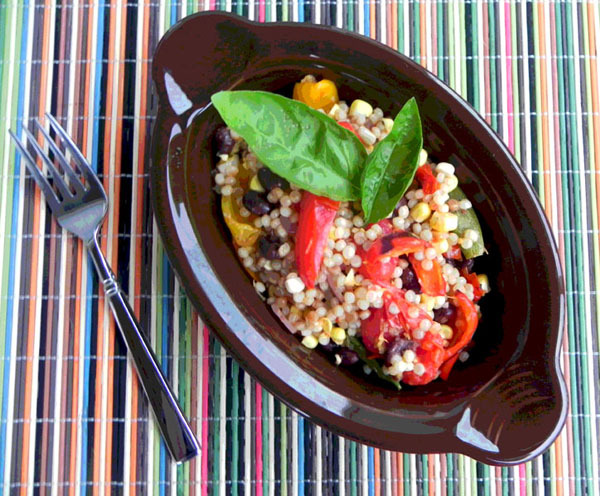 Finally, in a large bowl, stir together roasted vegetables, raw corn, couscous, and black beans. Mix in lemon zest and juice, then top with basil. Serve chilled. I could eat sugar snap peas all day!! This recipe looks great! I love Israeli couscous! And sugar snap peas, heck yeah. This sounds like something totally up my alley! And it looks really flavorful and delicious.